A component link is a reference within the content, or meta data of a component (A), to another component(B). The link in component A is a reference based on the unique ID from component B. The anchor text is not shown. Goal: To minimize effort in managing internal links. The advantage is that you will never have broken internal links on your website. 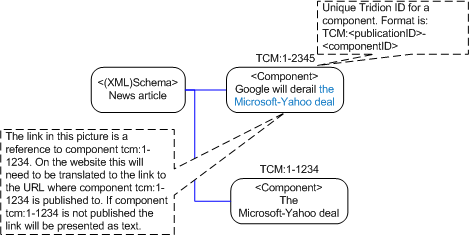 A component can only link to other components that are in the same publication. As cross link’s typically occur between content within the same domain and language (English, Spanish), you want all of this content in one publication. Component linking is therefore one of the things to keep in mind when designing a Tridion blue print (todo write about Blueprinting). Note that rendering component links uses resources from the web server. How to code Component Linking from one component to other.